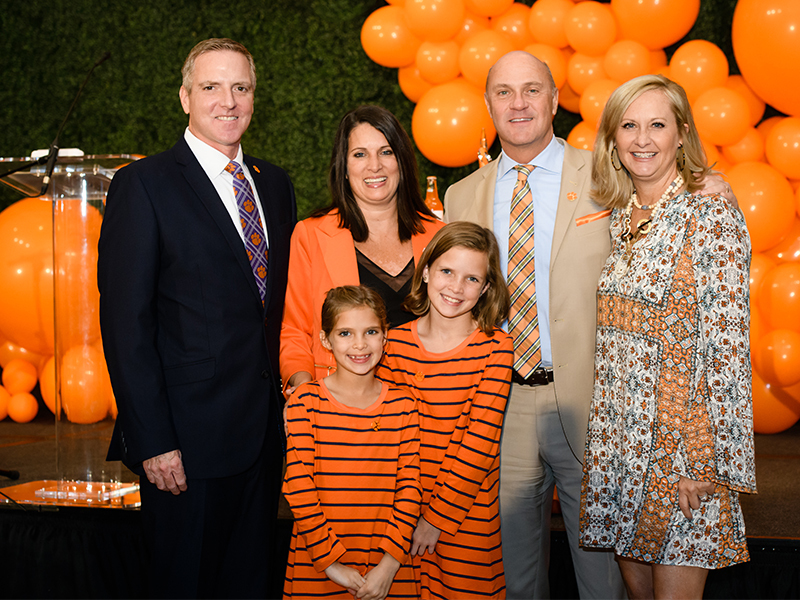 Ben and Cheri Dunmore ’93, MBA ’99 Phyfer have given $2.5 million to support the College of Business and student scholarships. With this transformational gift, the Phyfers became the third Cornerstone Partner for Academics. The Cornerstone program is made up of visionary individuals who commit funding of $2.5 million or more to help set the course for Clemson’s future as one of the nation’s top-ranked public universities. $2 million for Phyfer Auditorium; it’s the largest gift to date for the new College of Business building. $380,000 for the Phyfer Innovation Hub at Greenville ONE. The Phyfers have previously given to other initiatives including the Women’s Leadership Initiative, the College of Business Dean’s Excellence Fund, the WestZone project and several scholarships. After graduating from Clemson, Cheri joined Sherwin-Williams, where she rose to become president and general manager of the consumer brands division. She joined Fortune Brands Global Plumbing Group as president of Moen U.S. in 2018. She was named to Clemson’s Board of Trustees in 2016 and is a former member of the Clemson University Foundation board and a past chair of the College of Business’ Trevillian Cabinet. Ben is a real estate investor/developer who has built properties in the Atlanta and Cleveland areas. He also serves on Clemson’s MBA executive board. The Phyfers live in the Cleveland area with their daughters, Allison and Danielle. Micky ’75 and Amy Scott know the vital role the forestry industry plays in South Carolina’s economic vitality and environmental health. The Scotts, with Micky’s brothers Bill and Hank, are fourth-generation owners of wholesale lumber and pole manufacturer Collum’s Lumber Products in Allendale, S.C. Collum’s was founded in the 1930s and has grown into one of the most advanced sawmill and planer operations in the Southeast. Now, the Scotts have given more than $1 million to the College of Agriculture, Forestry and Life Sciences to create three endowments that will support the recruitment and retention of students in the college; provide enrichment opportunities to students in the forestry and environmental conservation department; and fund scholarships for students to participate in Forestry Summer Camp, a seven-week experiential learning curriculum to build skills essential to professional success in the forestry industry. Dean Keith Belli said the Scotts’ gift will help the College of Agriculture, Forestry and Life Sciences recruit and retain the best students and enhance the forestry curriculum with hands-on learning opportunities. Billy Fox, a veteran and junior forestry major from Wallkill, New York, is one of those students. Fox participated in the Forestry Summer Camp and said the experience honed his skills and opened his eyes to the array of careers in the forestry industry. 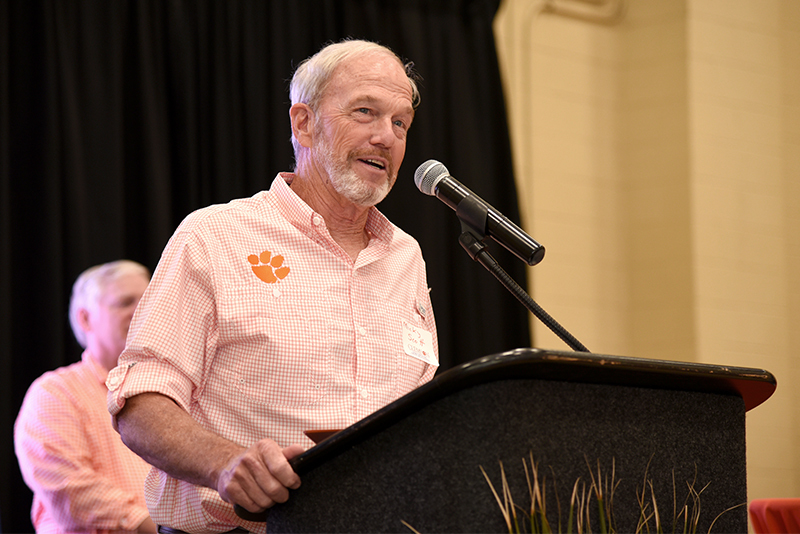 Micky Scott, whose bachelor’s degree is in forest management, is chair of Clemson’s Timberland Legacy Advisory Committee and a board member of the Wood Utilization + Design Institute. Marilyn Godbold’s life-changing gift began in an unlikely place — a meeting she attended as a guest. 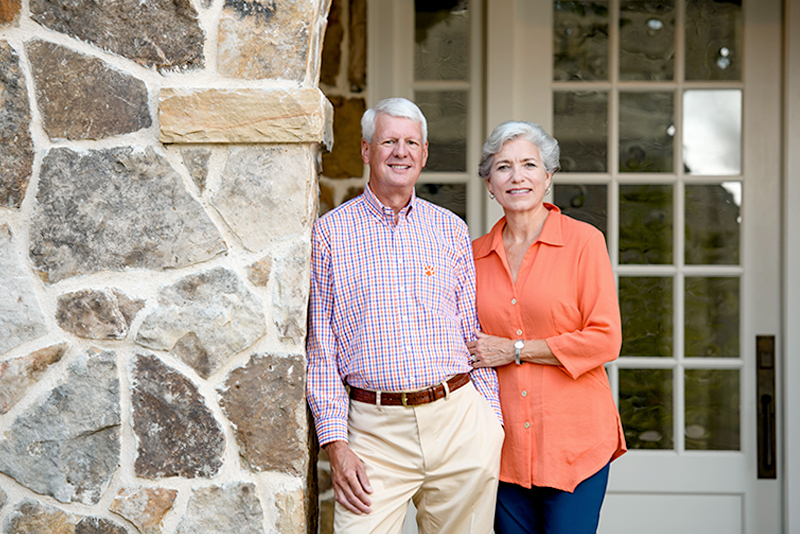 Godbold’s affinity for Clemson began with her husband, Asa Godbold, who graduated from Clemson in 1969 with a degree in building construction. Asa Godbold was named to the Board of Visitors, and since spouses are routinely invited to the meetings, Marilyn attended every meeting with him. Though she had no prior connection to Clemson, she quickly fell in love with the University. At the final Board of Visitors meeting of Asa Godbold’s term, Marilyn sat in on a presentation about ClemsonLIFE and its goal of providing a postsecondary education to students with intellectual disabilities. On the way home, Marilyn immediately decided to change her will to make ClemsonLIFE a part of it. “ClemsonLIFE resonated with everything she was as a person, and she wanted to make this program available to anyone who needed it,” said Asa. Marilyn died in late 2017; her planned gift to ClemsonLIFE will provide grants and financial aid. 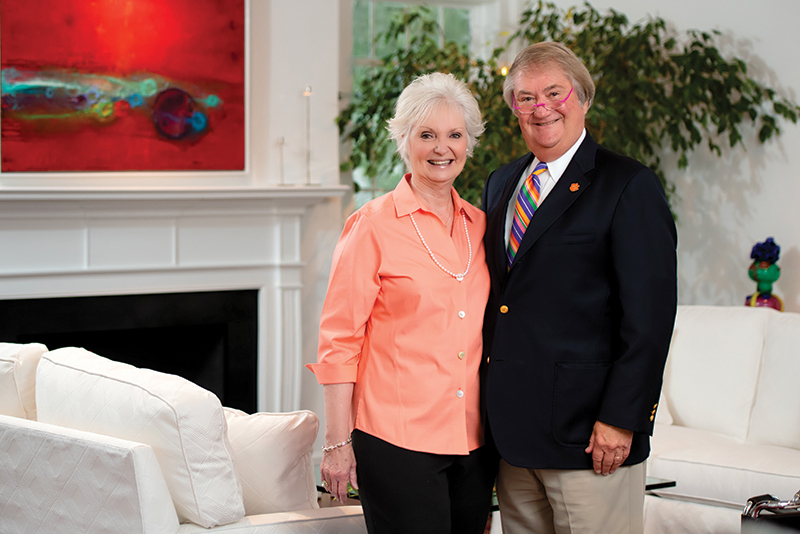 His wife’s generosity inspired Asa to continue giving himself by creating the Asa and Marilyn Godbold Clemson FIRST Grant-in-Aid, a scholarship for first-generation students. He and his wife, Becca, make things happen in many arenas: education, architecture, business and community-centered philanthropy. At Clemson, their latest gift of $100,000 will provide opportunities for architecture students by funding an endowment created in the name of mentor and friend George C. Means Jr.
Means established a health-focused studio in the School of Architecture at Clemson that has grown into today’s Architecture + Health graduate program. As the program celebrates its 50th anniversary, the Architecture + Health studio will officially carry the name of George C. Means Jr.
Ben graduated in 1968 and earned his master’s degree in 1974. In between degrees, he met his wife while working in Charlotte. After a long courtship, they married, with George Means as best man. For a few years, Ben taught full time at Clemson and was an assistant campus planner. Becca educated younger students in Anderson and earned a master’s degree in education at Clemson. Ben’s career led them to Greenville, then to Charlotte and back to Greenville. Ben wants people to remember that Means was a man with big ideas and an unparalleled devotion to students. Through the many lives he shaped over the years, Means’ influence traveled far beyond the studio that now bears his name. The Rooks said they want their gift to the Means endowment to help keep Clemson a place where extraordinary teachers can deliver extra care and individual attention to each student. “That is what makes Clemson great,” Ben said.